We Are Getting Close to a Peaceful Transfer of Power Here in the United States. But there Are Factors in Place that have People both Angry and Hopeful. One Country has Taken a Shot at the Outgoing Bush Administration. 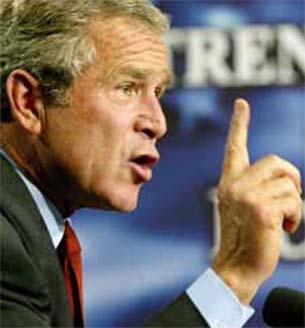 A Group of Activists have Prepared a Position Paper for the Incoming Bush Administration. In A Parting Shot at the Outgoing Bush Administration the Government of Eritrea has taken an Unusual Step. It has Accused this Administration for the Problems that Plague Somalia. There is a Legitimate Claim Here as US Naval and Air Assets assisted the Ethiopian Forces when they Intervened in 2006 to Prop up the Weak Transitional Government. Currently the Main Source of Income in Somalia is Piracy. Eritera feels that by removing the Islamist Militia from Power it created a vaccum that needed to be filled. In another Front Eritrean Forces have moved into Djibouti and seized a small area. There are US Forces currently stationed in Djibouti. Freedom of Religion is a Major Concern within this Country as well. President Bush will soon be Leaving Office. This Week A Group of African Focused Advocacy Groups (Including Africa Action and Caring For Kaela.) Issued A Policy Paper regarding the Situation in Chad. The Situation in Chad has been Plagued with Violence over the Last Few Years as the Situation that is Occuring within Neighboring Darfur has spilled over the Border. Currently there is a EU Peacekeeping Mission Currently in the Country. Earlier this year A Rebel Movement that was in the Minds of Some People Inspired to Act by the Current Sudanese Government launched an Attack against the Chadian Capital of N'Djamena. There are 4 key Reccomendations that this Paper Suggests that the Incoming Administration Take. 1.) Urge the Chadian Government to implement a Comprehensive and inclusive Peace Process to Stabilize Chad. 4.) Provide Adequate and Equitable Funding within the context of an overarching Chadian Development Strategy. One thing has become clear over the last few years: The Futures of Chad and Darfur are intertwined. The Confused Eagle will continue to Monitor this Situation.